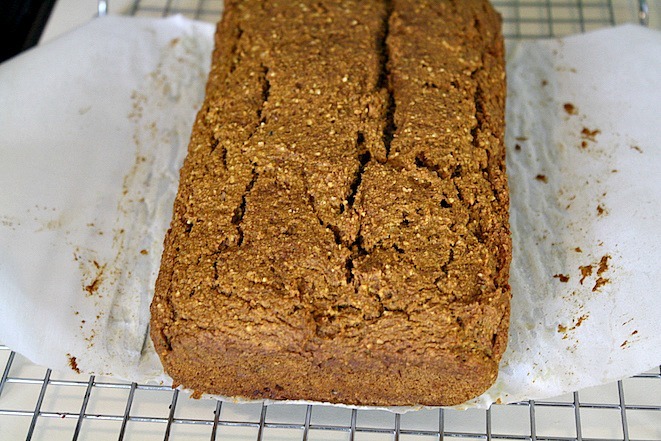 You’re about to feel so good about enjoying this Vegan Gluten Free Pumpkin Bread, so here’s what you need: Salt, Pure Maple Syrup, Cinnamon, Ground Nutmeg, Vanilla Bean Paste (or extract), Ground Cloves, Pumpkin Purée, Coconut Oil, 1 Flax Egg (1 T. ground flax plus 3 T. water that have been whisked and set aside for 5 mins), Coconut Palm Sugar, gluten-free Oat Flour, Almond Meal, Baking Powder, and then Baking Soda. Let’s prep a bit by preheating the oven to 350 degrees, and then spray your loaf pan and line with parchment paper. 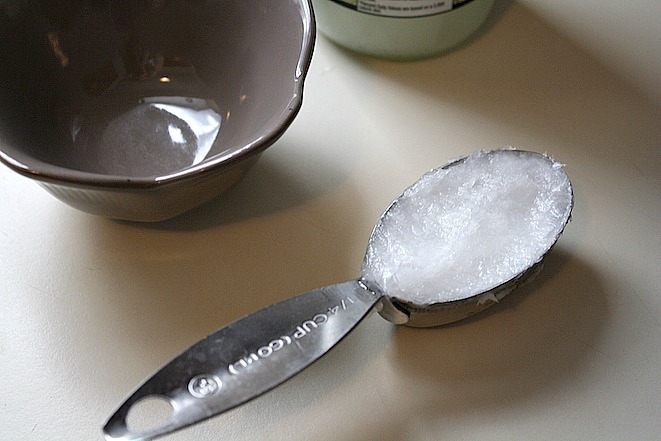 Most likely your coconut oil will be solid, so we want it melted. 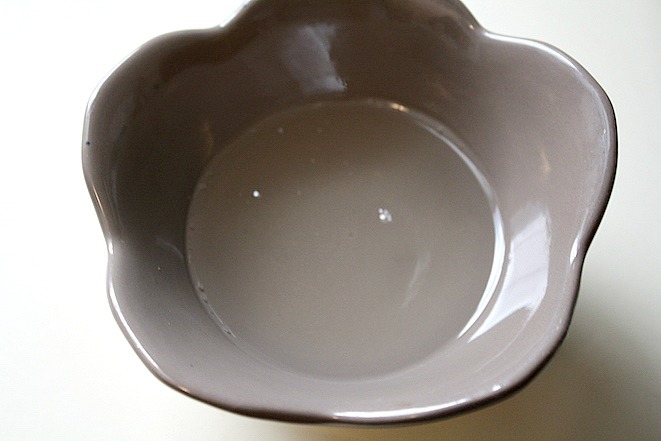 Melting the oil is a breeze, so measure out 1/4 cup of oil and pop it in a bowl in the microwave for 30 seconds. Then you’re left with clear, melted oil! 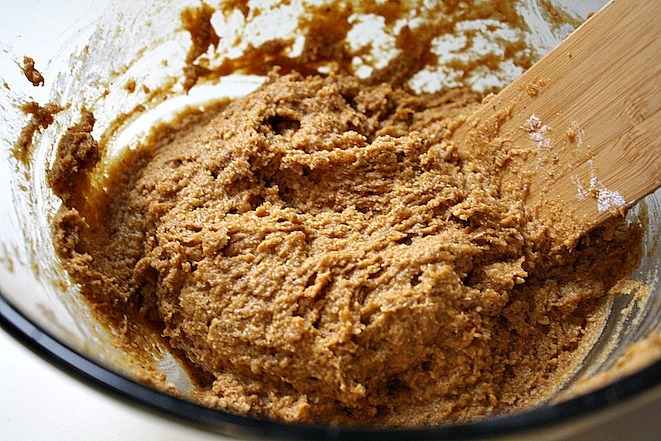 Now grab a large bowl and then add all of the wet ingredients into it for the Vegan Gluten Free Pumpkin Bread including 1 cup of pumpkin purée, the melted coconut oil, 1/2 cup plus 2 tablespoons of maple syrup, 1/2 cup plus 2 tablespoons of coconut sugar, 1 flax egg, and a teaspoon of vanilla bean paste. 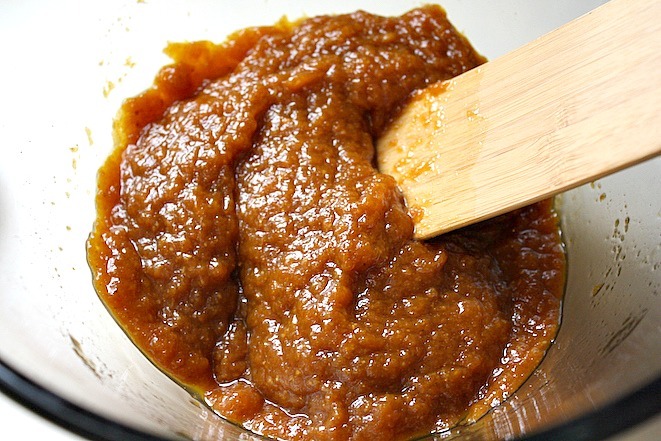 Then use a spatula to fully combine the wet ingredients. In the same bowl you’ll then add all of the dry ingredients including 2 cups of oat flour, 1/2 cup of almond meal, 1 teaspoon of baking soda, 1/2 teaspoon of baking powder, 1 teaspoon of ground cinnamon, and 1/2 teaspoon each of ground cloves and ground nutmeg, and 1/4 teaspoon of salt. Then stir to combine the batter being careful to stop once the flour is mixed up and the batter isn’t overworked. Now transfer the batter to the lined loaf pan and then spread it across the top so it’s flat. Then use a butter knife to cut a slit (not too deep) that’s off-center down the length of the loaf. Bake in the oven for 55 minutes, and then note if you’re using a 9.5-inch loaf pan or 60 minutes if you’re using an 8-inch pan. So here’s the gorgeous Vegan Gluten Free Pumpkin Bread after baking. When you insert a toothpick into the bread and it comes out clean, then you’ll know the bread is done. Then let the bread cool for 2-3 hours right in the pan. Once the bread is cool, then gently lift it from the pan and you’re ready to enjoy! Slice up and devour this delicious, moist, and allergy-free Vegan Gluten Free Pumpkin Bread, and then happy eating! 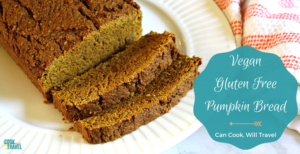 I love finding ways to make my favorite foods a bit healthier, so this vegan and gluten free pumpkin bread is the perfect example! Moist and so delicious! Begin by preheating the oven to 350 degrees, and then mix up your flax egg and allow it to set for 5 minutes. 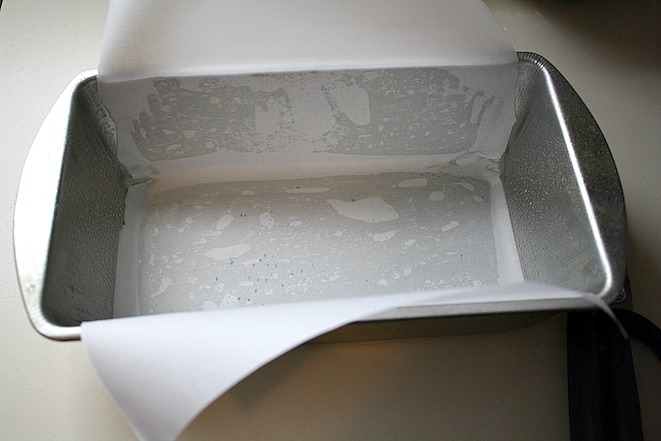 Spray your loaf pan with cooking spray, and then line it with parchment paper. Then melt your coconut oil in the microwave for about 30 seconds if it’s solid. 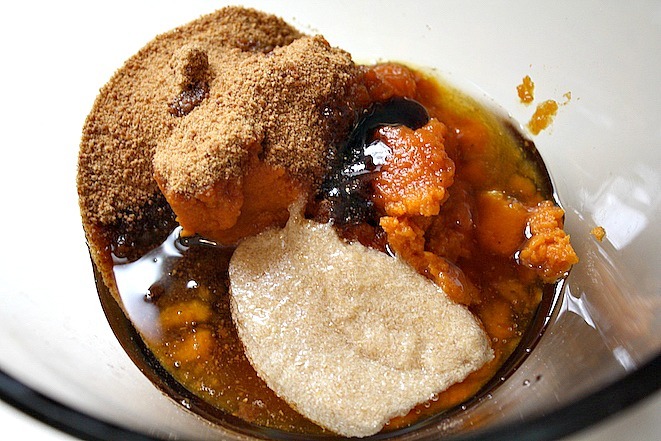 In a large bowl, add a cup of pumpkin purée, coconut oil, maple syrup, coconut sugar, flax egg, and a teaspoon of vanilla and then stir to combine. 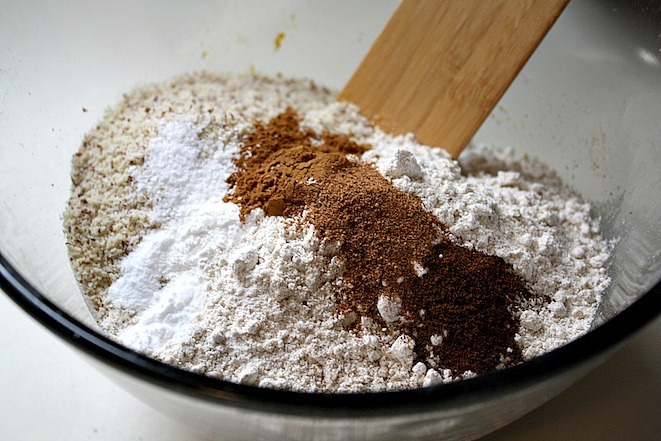 Finally add the dry ingredients including the oat flour, almond meal, baking soda, baking powder, cinnamon, cloves, nutmeg, and salt to the wet ingredients. 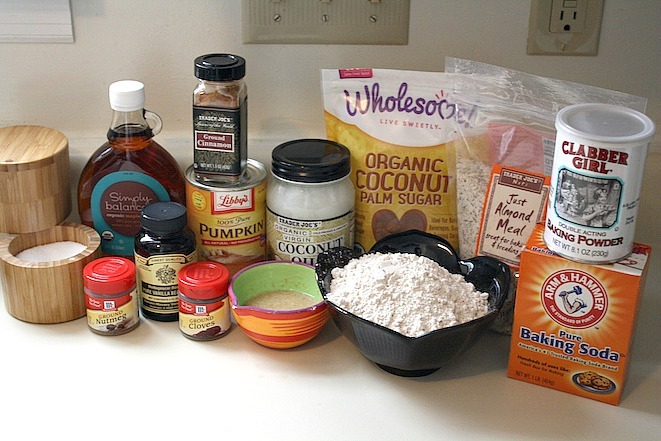 Fold the dry ingredients into the wet ingredients, and then stir until the flour is combined but don’t overtax. 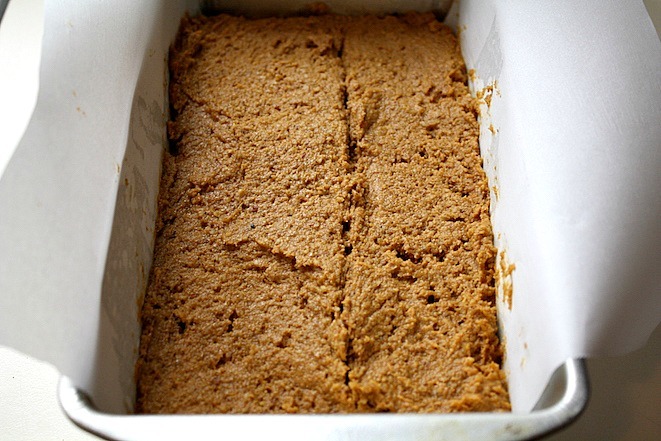 Pour the batter into the greased loaf pan, and then bake in the oven. If you use a larger 9.5” loaf pan like I did, then start with 55 minutes, and if you’re using an 8” loaf pan, start with 60 minutes. Your bread will be done when you test it with a toothpick and it comes out clean. 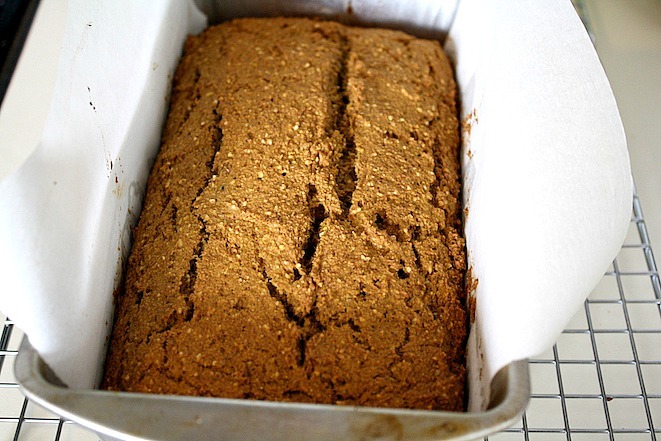 Allow the bread to cool completely then remove it from the loaf pan, slice, and then enjoy! Previous Post: « Cheers to the Best Homemade Chili I’ve Had!